Utility solar project procurement soared in Q2 2018 as component prices declined and home solar installations steadied after a 15 percent contraction last year, according to the latest U.S. 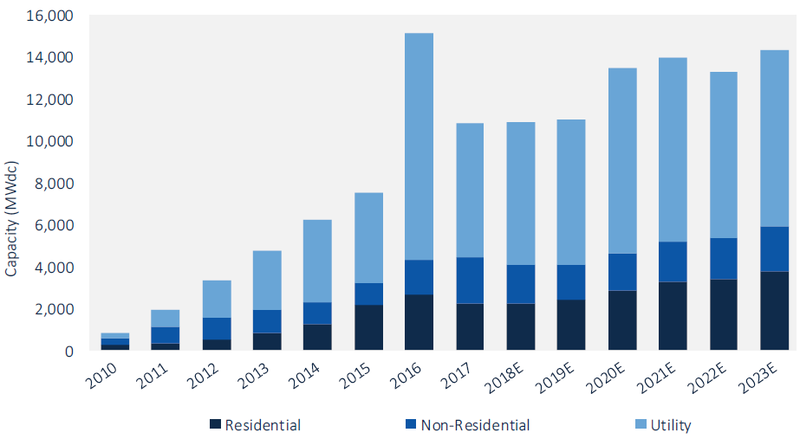 Solar Market Insight Report from Wood Mackenzie Power & Renewables (previously known as GTM Research) and the Solar Energy Industries Association (SEIA). This is the first quarter where the data clearly show that tariffs took a bite out of the solar market . . . Looking ahead though, the report forecasts an acceleration of solar deployment in the second half of 2018 driven by utility-scale projects. According to the report, 8.5 gigawatts of utility PV projects were procured in the first six months of the year, the most ever procured in that timeframe. Read more here. This entry was posted in NewsBlog, Research and tagged Nebraskans for Solar NewsBlog, solar development in the U.S., Solar Energy Industries Association (SEIA), solar tariffs, U.S. Solar Market Insight Report for Q2 2018, Wood Mackenzie Power & Renewables on September 13, 2018 by Helen Deffenbacher.